Car finance – is the industry speeding? Alex Golledge, Tim Pike & Phil Eckersley. The car industry’s fortunes play an important part in the stability of the broader economy. The automotive industry (including manufacturers, their suppliers, dealers, servicing, leasing and refuelling) accounts for over 4% of GDP. Demand for new cars is particularly sensitive to the economic cycle, typically falling sharply in recessions but growing strongly in recoveries (Chart 1). So it was not surprising that the Government introduced a car scrappage scheme between April 2009 and March 2010 to stimulate private new car demand following the recession. This article examines a fairly recent development in the industry, namely that new car purchases nowadays are mostly financed by manufacturers’ own finance houses. This has a risk of exacerbating the cyclicality of new car sales shown in the chart. Moreover, manufacturers increasingly bear the risk of future falls in car prices, potentially making the industry even more vulnerable to macroeconomic shocks. Traditionally, households purchased new cars using either hire purchase or other forms of unsecured consumer credit. Finance was provided by a third party (usually a bank loan) if the consumer could not buy the car outright, and was usually harder, slower and more expensive to obtain than it is nowadays. In the past 10 years or so, however, the car finance industry has undergone substantial changes, effectively making it much easier for households to finance new cars. First, a growing proportion of finance is now provided by the car manufacturers themselves, often through their own finance houses. Intelligence gathered by the Banks’ Agents suggests that these so-called “captive” finance providers have a market share of about 70% of all private new car finance. Second, households increasingly rent their vehicles using Personal Contract Purchase (PCP) plans. Industry contacts of the Bank’s Agents estimate that around two-thirds of private new car buyers now rent their vehicles using PCPs. Under PCP, the car buyer does not initially take ownership of the vehicle, but instead rents it for an average length of typically three or four years. At the end of the contract, the renter has the option either to return the vehicle to the finance house, or purchase it at a price specified in the initial contract. This price, or “balloon payment”, is based on the finance house’s estimate of the car’s residual value at the end of the contract, or “Guaranteed Future Value (GFV)”. Like every forecast, calculating residual values is not an exact science. The balloon payment could turn out to be higher than the value of the car in the used market, in which case the renter is better off just returning the vehicle to the finance house, which might then make a loss on the transaction. Thus, finance houses are typically conservative when making assumptions about the car’s residual value, such that the “balloon payment” is typically less than the market price. The renter then has “equity” left in the car at the end of the contract, leaving three further options: making the balloon payment to take ownership, selling the car privately to release the equity, or using the residual equity to part-finance another new vehicle. PCPs are extremely popular with car manufacturers and their dealers, as they tend to “lock in” customers to repeat purchases either at, or prior to, the end of the contract. Agents’ research suggests that around half of UK households renew their PCP plan with the same manufacturer. Indeed, once a buyer has positive equity in their vehicle — which in recent years, when used-car prices have been robust, has been after about 2-2½ years of the PCP contract — dealers will usually offer the buyer a PCP on a new car (a process known as “flipping”). The popularity of PCPs has thus been associated with a shortening of the replacement cycle for private buyers, thereby boosting the aggregate level of consumer demand for new cars. PCP has changed the way many consumers think about cars. A consumer who might never own the car is likely to view it in the same way they view a mobile phone contract, i.e. just another monthly Direct Debit. PCP has made it cheaper to run a car, especially one with a high residual value, and it removes the risk of falls in the car’s resale value. Under PCP, the customer only has to finance the anticipated depreciation of the vehicle (plus the interest-only element levied on the GFV) during the length of the contract, and not its capital value — unless of course the customer subsequently purchases the car by making the balloon payment. Premium brands are thus more affordable, explaining much of the ‘badge inflation’ in recent years. 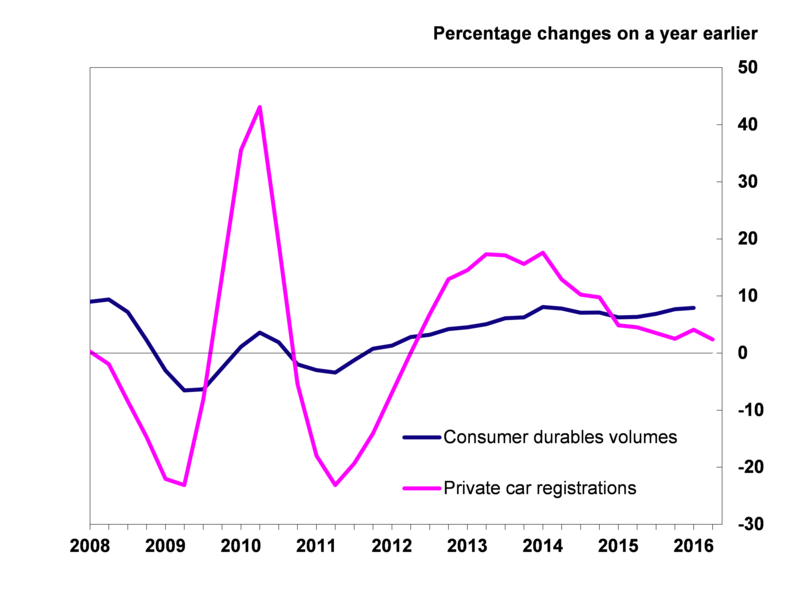 This change in buyer behaviour has undoubtedly contributed to the sharp rise in new car registrations and the level of consumer debt in the economy in recent years. Figures from the Society of Motor Manufacturers and Traders (SMMT) indicate that new car registrations were at record levels of 2.63mn units in 2015, up 6.3% on 2014 and 36% above their level in 2011. Comparable figures for private car sales (which accounted for nearly half the market in 2015) were 2.5% and 47% respectively. Data for the first half of 2016 show that this upward trend has continued, with total registrations up 3.2%, and private sales up 1.9%, on a year earlier. Speaking to senior managers in the car industry, we’re often surprised at just how bullish manufacturers’ growth targets are for the following year. Indeed there is a joke in the industry that if one adds up the aspirations of all the manufacturers selling into the UK market there is a total market share of 150%! But does the pursuit of ambitious targets increase industry vulnerabilities? Our research suggests that the industry’s scope to sustain recent growth rates is increasingly at risk. In particular, the industry’s growing reliance on PCP has made it more vulnerable to macroeconomic downturns. First, the demand for new and used vehicles could fall sharply in the case of deteriorating economic conditions. The manufacturer would be exposed not only to losses from falling sales of new cars, but also from the impaired value of rented and leased vehicles returned at the end of their contracts should the balloon payments exceed the vehicles’ market values. Second, the adverse effects of an economic downturn on new car demand might be magnified, should they coincide with increases in interest rates over the next few years. Consumers’ response to higher finance costs is difficult to predict precisely. Some consumers may choose to trade down to a cheaper car; others might retain their existing cars for longer, extending the replacement cycle. Either way, expenditure on new and used cars would fall and residual values would be adversely affected. Third, a significant contraction in residual values of used vehicles would push the majority of cars rented under PCP into negative equity. The new car market is not immune to externalities such as: environmental and technological factors, which might sharply increase demand for electric cars or, in the longer term, driverless cars; higher environmental taxes which reduced the demand for diesel-engine cars; a sharp rebound in oil prices might reduce the demand for “gas-guzzling” models; and finally product recalls which might alter buyer perceptions. In any of these cases there could be a sharp rise in the number of vehicles returned to the finance providers at the end of their contracts. The consequent increase in supply of used cars could result in the finance companies suffering large impairment charges, due to falling used car prices. Fourth, the growth of internet purchasing is associated with more perfectly competitive markets. The launch of carwow for example opens up the market for car traders to bid for business, substantially increasing catchment areas for distributors. Such trends present threats to established businesses and are already leading to margin erosion. In conclusion, the UK car industry has seen very strong demand growth in recent years, which most participants believe is not sustainable. In addition to the stimulus associated with low base rates and thus cheap car finance, growth has been buoyed further by various structural changes in the industry, including the rising market share of PCPs. Those structural changes have: (a) concentrated financial risk in an industry that is especially sensitive to the economic cycle (in contrast to previous cycles when risk had been shared to a greater degree with the household sector); (b) contributed to increased household borrowing, reflected in the very rapid growth of car finance in recent years and a trend towards premium models; and hence (c) made the car industry more vulnerable to negative shocks, including hikes in interest rates, exogenous falls in market prices of used cars, lengthening of the replacement cycle and changes in consumer tastes. Industry innovation in the area of finance has been great news for consumers — a greater percentage of us can now drive the more expensive car brands — but as the industry constantly chases targets, volume and market share, it becomes increasingly vulnerable to shocks. Alex Golledge, Tim Pike & Phil Eckersley work in the Bank’s Agency for South East and East Anglia. I don’t quite understand this. Surely a proportion of purchase/hire contracts are securitised – I know many manufacturers do so but I don’t know what proportion of the market this accounts for. I also know that the finance arms of several manufacturers are lobbying in Brussels in support of legislative proposals for ‘simple, transparent and standardised’ securitisation, hoping that this would allow them to sell risk on more easily and reduce capital requirements. So, maybe the risk is less with the manufacturers, more elsewhere, on the buy side? Pension schemes, for example. None of this rules out systemic risk, should the trade tank.